Fumi Johns Stewart, Executive Director of The World Peace Prayer Society (WPPS), and Rev. 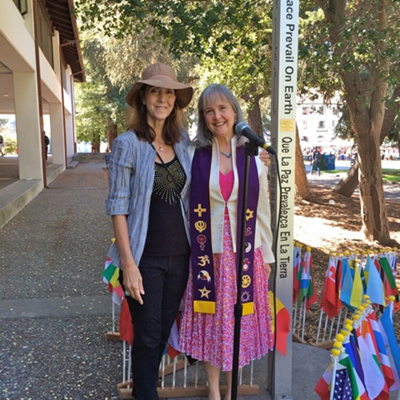 Deborah Moldow, the WPPS Representative to the United Nations, both took part in a beautiful rededication ceremony for the Peace Pole at St. Mary’s College in Moraga, California on Oct. 1, 2014. Prof. Barbara McGraw, Director of the Center for Engaged Religious Pluralism at St. Mary’s, had invited Rev. Deborah as the annual interfaith speaker on Wednesday evening, Oct. 1. Deborah discovered that St. Mary’s had a Peace Pole installed on the International Day of Peace in 2007, and that it is used weekly as a focal point for gatherings on issues of social justice during the college’s Wednesday afternoon “Community Time” at 1:00. These gatherings are led by renowned poet and faculty member, Prof. Brenda Hillman. They decided that the afternoon prior to Deborah’s talk would be a wonderful opportunity to rededicate the Peace Pole. Fumi Johns Stewart was invited to speak on behalf of The Peace Pole Project, and Rt. Rev. William E. Swing, Founder and President of the United Religions Initiative, was invited to offer some inspiring remarks. 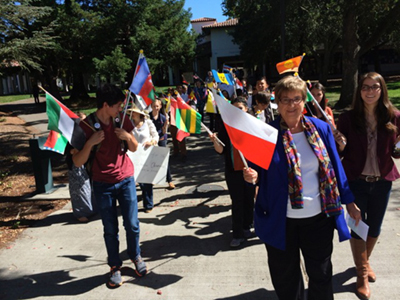 More than fifty students showed up to take part in a procession to the Peace Pole, where Prof. McGraw gave a warm welcome and Brother Michael offered a deep and moving interfaith invocation. Fumi spoke affectingly about what it was like to be the age of the students and see her first Peace Pole. She taught everyone how to say “May Peace Prevail on Earth” in Japanese. Deborah introduced Bishop Swing, the visionary who launched the United Religions Initiative from San Francisco, just across the Bay. He then delivered spontaneous remarks about how he had engaged in regular interfaith dialogues right there on St. Mary’s campus. President Donahue of St. Mary’s showed up unexpectedly to see his old friend, and he was handed the flag of the United States of America. 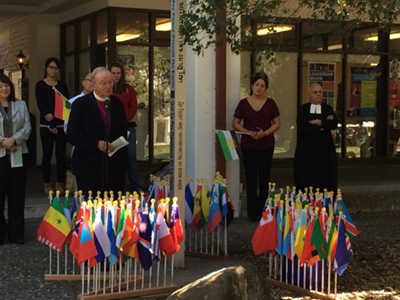 Prof. McGraw led a deep moment of silence asking everyone to project their prayers for peace into the Peace Pole, followed by an exquisite performance of John Lennon’s “Imagine” by gospel singer Vickia Brinkley. Brenda Hillman read two of her lovely poems, including one written specially for the occasion. Rev. 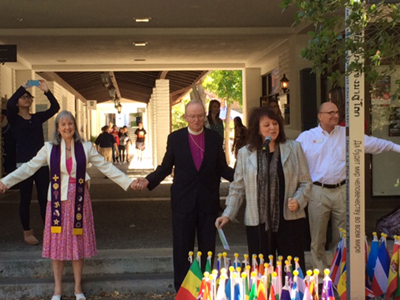 Deborah closed the event by leading a brief World Peace Prayer Ceremony. Everyone around the Peace Pole raised their flags in turn, sending love and peace to each country. All concluded by saying three times, “May Peace Prevail on Earth!” and processing away with the flags from the newly re-consecrated ground. And when words fail you, there are those five powerful words inscribed on the Peace Pole here at St. Mary’s College that we rededicated this afternoon and its 250,000 cousins around the world, May Peace Prevail on Earth. We began with a meditation, so let us close by saying this prayer together: May Peace Prevail on Earth! Prof. McGraw wrote: “Your speech is still resonating with my students. They have incorporated some of your ideas into their conversations in class, as we move on through the semester. People are still amazed by the Peace Pole event.” May the St. Mary’s Peace Pole continue to radiate its prayers for generations of students to come.